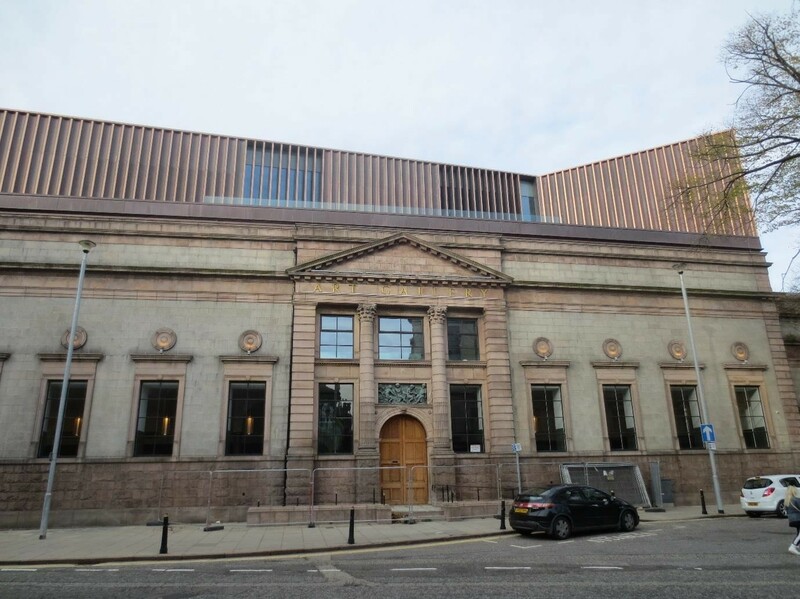 Aberdeen Art Gallery is to benefit from a public realm package brought forward by the city council which calls for an improvement to the setting of the listed landmark through new paving and street furniture ahead of its reopening in August. Currently undergoing a program of extension and refurbishment the gallery is being lined up to serve as a new ‘arts destination’ by improving the galleries setting and enhancing accessibility. A streetscape application filed by Aberdeen City Council calls for a narrowing of the roadway at the junction of Blackfriars Street and Schoolhill together with the removal of the current main entrance to form a new public plaza. Consisting of Corrennie pink granite steps, Blackhills grey granite paving and a whinstone footway with bronze handrails this arrival space will also include totem display boards advertising upcoming events. In a statement the Council wrote: “The proposed steps will run parallel with the Art Gallery façade and are restrained and angular in keeping with the Art Gallery façade’s detailing and will rise no higher than the facade’s existing pink granite base-course tying in with the finished floor level of the Art Gallery. It is also proposed to replace a concrete slab terrace of the Aberdeen War memorial with Kemnay granite to be more in keeping with its surroundings.